As students continue to flock to computer science, Stanford’s CS department has to grapple with the challenges of hosting the most popular major on campus. With introductory courses drawing hundreds of students and some upper-division classes drawing close to a thousand, challenges range from crowded office hours to ensuring the quality of large-scale teaching while creating an individual experience for each student. Stanford CS department tackles growing class sizes (LUCY BREWER/The Stanford Daily). CS has surged in popularity at Stanford within the last decade, although a previously rapid increase has gradually begun to slow down. This increase in popularity has now leveled out. As of fall quarter of this school year, there were 663 total undergraduates enrolled in the major, similar to the 661 enrolled in fall quarter of the 2015-16 academic year. Although growth in the popularity of CS has begun to slow down, the number of students enrolled in this program continues to surpass all other majors. Human Biology is the second largest major at Stanford, and in the fall quarter of 2016, there were 240 students enrolled in the program. That’s 423 less than the number enrolled in the CS program during the same quarter. This vast number of students presents the challenge of organizing large classes and ensuring that the quality of teaching is maintained on a bigger scale. Most CS classes do not have an enrollment cap. An unusual aspect of the CS department is upper-division classes that continue to have similar sizes to introductory classes and even surpass them. This year, two particularly large upper-division classes include Artificial Intelligence (CS 221) and Machine Learning (CS 229). Large class sizes in these upper-division courses may influence teaching methods and styles, particularly in finding ways to engage students more critically with the material. It also presents the challenge of finding a balance between mass-teaching material while tailoring an individual experience for each student that is often the goal of upper-level courses. One side-effect of larger classes is the volume of honor code cases some instructors have had to grapple with. For instance, the teaching staff for the latest offering of CS 229 were uncertain about how to handle the inordinate number of suspected honor code violations that they found while grading the third problem set. Later in the day, CS 229 course coordinator and department program manager Swati Dube sent out a correction stating that they would revert the point deductions and notify OCS in compliance with the honor code. “We are not deducting any points based on suspicion of honor code violations, and we plan to report all suspected violations as we always do,” Dube wrote. She described the original post as a “mistake” in an email to The Daily. One student in CS 221 last fall said the increase in class sizes has made complying with the honor code more challenging for students as well. The student, who asked to stay anonymous, said that the long lines at instructors’ office hours lead many students to seek more hands-on help from their peers instead – behavior which can count as “unpermitted collaboration” under the honor code. She described a certain time in which section leaders opened up the queue for thirty seconds at the beginning of an allotted time and then closed the line to work through the number of students who had signed up during this time. Apart from honor code violations, instructors and students agree that the combination of large classes and limited teaching staff have made it tougher to get help at office hours. Students concurred that overcrowded office hours detract from the student experience. 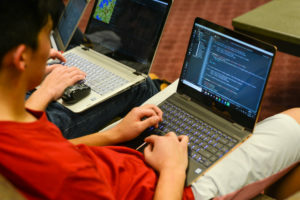 “I try to avoid the LaIR as much as possible because I hear so many horror stories about waiting for two hours,” said Aarthi Popat ’21, a current 106A student, referring to the help hours available to beginning CS students in Tresidder Union. Such challenges have encouraged professors and TAs to create new methods aimed at ensuring each student receives the necessary help — for example, by adopting online tools, including online office hours. Online office hours involve a similar queue to in-person ones and supplement video conversations with a virtual whiteboard to draw on, Gabrielsson explained. “It is different to teach over video form rather in person, but you get better at it,” he said. Aware of the popularity of CS at Stanford, the department administration is “working really hard to maintain these enrollments while still providing … a high-quality education,” according to Sahami. Others also emphasized that the CS department does not seek to turn students away. However, according to Júlio Mendes, a graduate student currently enrolled in CS 229, the significant increases in enrollment contribute to honor code violations. Mendes believes the hype surrounding machine learning attracts tremendous student interest, even if students don’t have necessary prerequisite knowledge. The CS 229 case was not the first time honor code violations have been widely suspected in CS courses. In 2015, CS 106A saw over over 100 violations reported, prompting a letter to all faculty from former Provost John Etchemendy Ph.D. ’82. “What makes me sad is the fact that by now, instructors are aware of the issue, yet they repeat the problem sets year after year, ” Mendes said. However, Gabrielsson said he has faith in the ability of the CS department to overcome the challenges posed by significant enrollment increases on the whole. Contact Arielle Rodriguez at arielle3 ‘at’ stanford.edu. Contact Elaine Park at elainep ‘at’ stanford.edu. Contact Alex Tsai at aotsai ‘at’ stanford.edu.